Between California and Hawaii, there's a teeming patch of garbage that's stretched over an area more than double the size of Texas. We already knew it was huge. There's a reason it's called the "Great Pacific Garbage Patch." But new research has found that there is many times more garbage in this patch than previously thought – 4 to 16 times more than past estimates, according to a paper published today in Nature Scientific Reports. "You start to see one debris, two debris, three debris and so on," he tells NPR. "Oh, there's a crate, oh, there's a buoy, oh, there's a bottle. And it's crazy because there's nothing else around. There's no land mass, there's no humans, there's nothing." Lebreton chalks up the difference between this estimate and previous ones to more advanced research methods. The team took more than 7,000 aerial photographs of the area – a method that they say is more accurate compared to previous observations from boats. "We realized by doing this that the overall stark estimate was much bigger than what we thought already," he says. 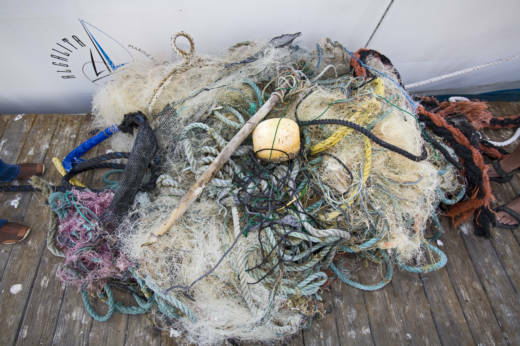 The team also trawled for samples of trash that they could analyze. More than three-quarters of the patch's mass is made of pieces of trash bigger than 5 centimeters, the researchers say, and nearly half of it was made up of fishing nets. In total, "we estimate 1.8 trillion pieces of plastic floating in this area," Lebreton says. Plastic items that have broken down to very small pieces – also called microplastics – are most worrying because ocean animals can ingest them, then they work their way up the food chain. It's probably not just the improved methods that account for the larger estimate, Lebreton adds. The sheer amount of plastic also appears to be increasing. That's clear when they compare the concentration of microplastics in the water. The tsunami that hit Japan in 2011 also likely played a role in adding to the amount of plastic in the patch, though it's not easy to tell where the debris is coming from. The best way to research that, he adds, is by identifying "clues, which could be like writings and logos and symbols and so on," and 30 percent of those items are coming from Japan. The patch is formed because of the Earth's rotation, which creates water circulation around the equator that, in turn, powers clockwise currents in this area. But the researchers say that not every kind of plastic can travel all the way to the patch – it must be buoyant enough to float on the surface. Given how much plastic goes into the ocean — it's estimated to be about 8 million tons per year — Lebreton says he expected to see more of it in the gyre, as the floating plastic pancake is known. "Obviously a lot of plastic is missing and one explanation is yes, a lot of it is likely sinking on the sea bed," Lebreton says. "I think that underscores this ongoing, age-old question — where are all the missing plastics?" says Nick Mallos, the director of the Ocean Conservancy's Trash Free Seas Program. "There's a lot of pathways along the way, whether it's sinking into sediment, whether it's being ingested by marine organisms, whether it is actually being spit out onto the beaches." He says that it's crucial to try to prevent fishing gear like nets from getting lost at sea. Part of the conservation strategy, Mallos adds, should focus on "major river arteries, coastal environments where the debris is most concentrated" — before it gets to the open ocean. "Cut off the source," Mallos says, "and then let's take care of what's still out there."